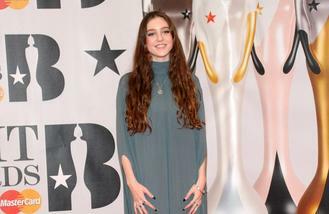 Birdy sings Celine Dion songs to warm up for her gigs. The 20-year-old singer admits her backing band hate her choice of ballads by the Canadian warbler so much, she has to prepare in a different room. She said: "To warm up before a show I sing Celine Dion songs. My band hate it and I have to go next door." Though Birdy loves going on the road, she does find it tough being away from her family for so long. She said: "I miss my family when I'm away on tour. I'm a home bird. Going on tour is always exciting but there's often a bit in the middle where you want to go home." And when the 'Skinny Love' singer - whose real name is Jasmine van den Bogaerde - is away, her younger sister takes advantage of being able to raid her wardrobe, much to Birdy's annoyance. Asked when she last lost her temper, she said: "At my sister Caitlin, who is always stealing my clothes. She's three years younger than me and we are very close but a lot of theft goes on. "She owes me an apology. I had some lovely All Saints boots and she thought it would be a good idea to wear them to a festival. I recently found them in a plastic bag at home. They were all crusty." While she's comfortable on stage in front of large crowds, Birdy "can't bear" having to talk in public. She told Grazia magazine: "I can't bear watching myself talk. I feel far more comfortable singing and am definitely most confident on stage. I'd be happier if I could sing my way through life instead of talking." Sir Cliff Richard has signed a new record deal. Taylor Swift has given Thomas Rhett "the best music advice". Hugh Jackman was shocked when Barbra Streisand asked him to duet with her. The debut album by British band Viola Beach has been released posthumously. Jess Glynne, Jonas Blue and Rudimental wowed 35,000 fans at MTV Crashes Plymouth on Thursday night (28.07.16). Joe Jonas broke Britney Spears' alleged tour protocol with a hug. Bruce Springsteen is set to release a compilation album of rare tracks dating back to 1966. Brian Wilson is to release a live album featuring Zooey Deschanel and Kacey Musgraves. Singer Mary J. Blige has put her faith in a "divine plan" after filing for divorce.